A Northwestern fencer makes some moves on the strip. The Wildcats set the team record for wins at NU Duals last weekend. When most teams break a major record, the players know about it in that exact moment and celebrate accordingly. When No. 8 Northwestern broke the program’s single-season win record Sunday with their victory over Lawrence, the Wildcats’ fencers were unaware. They only found out they had beaten the eight-year-old record when coach Zach Moss told them after the team had finished competing Sunday. NU wrapped up their record-setting regular season at the NU Duals in South Bend this weekend. The Cats finished the weekend with an 8-4 record, improving to 47-9 on the season. The 47 wins broke the record of 45 established during the 2009-10 season. Moss, only in his second year with the program, said that breaking the record for wins in a season was not on his mind at the beginning of the campaign. “This level of success this early (in my head coaching career) was a surprise — a pleasant one — and definitely sets the standard for what we are capable of as a program,” Moss said. The biggest win of the weekend for NU came against No. 4 Princeton. It was the second meeting of the season between the two teams, with the Tigers taking the first matchup back in November. This second time around, the Cats pulled out a close 14-13 victory. The matchup went down to the final touch. With the score tied at 13, Filby went to the strip with the match on the line. After falling behind 4-3, Filby rattled off two straight touches to win the bout and seal the victory for the Cats. Filby said she did not know that hers was the deciding bout — she typically doesn’t like to know the score before she fences, because she feels it affects her performance. The four teams NU lost to — Duke, No. 1 Notre Dame, No. 5 Ohio State and No. 7 Temple – are all either ranked in the top 10 or received votes in the latest poll. Against Notre Dame, the Cats came close to pulling off the upset, but faltered in the last few bouts to lose 15-12. Moss said the team was tired on the second day of the tournament and he would like to see a rested NU face off against Duke and Ohio State again. 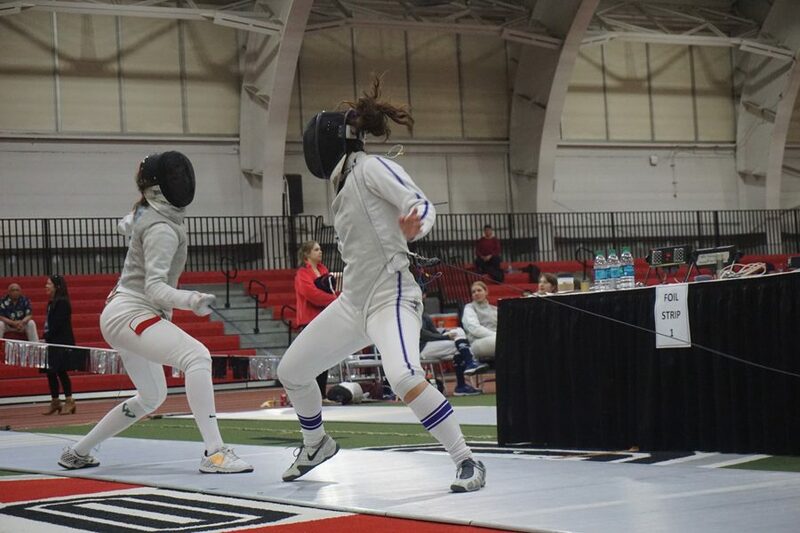 In their final regular season appearances in Cats uniforms, senior foil Lucia Procopio went a perfect 9-0 on the day and senior epee Anna Tolley went 7-1. With the senior class finishing its season, senior sabre Emine Yücel, who has another season of eligibility remaining, said that it is great that her fellow classmates can end their careers with two major records: most single-season wins and most consecutive wins.